Star Trek came into my world at Christmas with the original movies boxset then one thing led to another and I became a Next Generation addict (Patrick Stewart? Yes please). 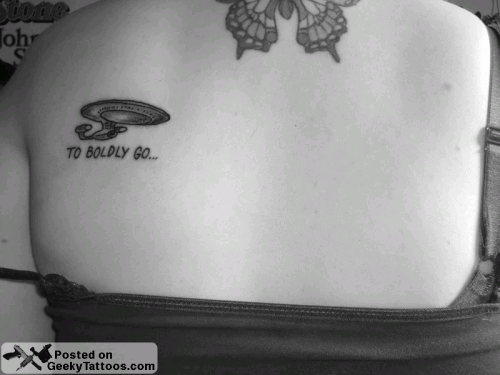 I knew I wanted another tattoo, something geeky so it was obvious what must be done. 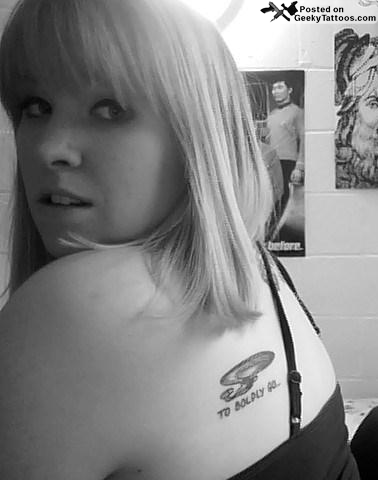 I had to get the USS Enterprise NCC-1701-D. I am now completely in love with it, it was well done and I keep straining my neck to look at it. Tattoo was done at Lab Monkey. Posted in Star Trek, TV. Tagged with Enterprise, Kerri, Lab Monkey, Star Trek.